Client Rights and Protections – As an accredited counseling program, Family Counseling of Columbus has numerous policies and procedures in place to ensure that your rights are protected, and that you are able to have any concerns taken care of promptly and professionally. Our documents “Your Rights as a Client of This Agency,” “Additional Client Information” and the “Client Grievance Report” form can provide you with additional information. Client Centered Counseling – Our treatment approach and philosophy at Family Counseling of Columbus is based on the belief that you – the client – should be in charge of the process, and that you will ultimately know what’s best for you. You and your counselor will work together as a team to make sure that you, your goals, and your wishes are at the center of the process, guiding your treatment. Client centered counseling approaches are built on this treatment philosophy, and mean that you guide the process – our counselors listen to you and base their approach and treatment planning on your goals and what works best for you. Along with this philosophy, we utilize evidence-based strategies and approaches, and follow “Best Practice” guidelines. This means that you can count on our counselors to know what the leading research and experts in the counseling fields recommend in terms of what works, and make those recommendations to you. As a result, over 95% of our counseling clients report that they feel an improved sense of hope, relief, and ability to cope or problem solve…after just their first session! 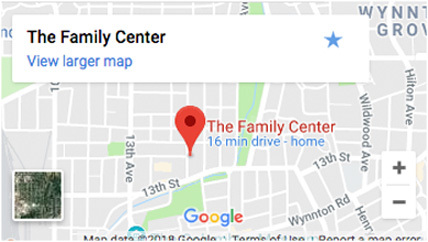 Customer Service – At Family Counseling of Columbus we believe that excellent customer service should be the first service we provide as we help individuals, couples, and families find the solutions they are looking for. 98% of our customers tell us that they would rate their customer service experience with us as being “excellent”, and would refer their families and friends to us. From the smile you hear on the telephone, to the smile you see at the customer window, to the responsive and respectful attitudes of our staff….we aim to please!